In semiotic studies, the protagonist is the perfect character. He’s unique. He stands out from the others for his qualities; and he has to last the whole story. Among sponsors, supporters, startups and investors, the protagonists of the next Made in Italy 2.0.2.0 Beijing Edition are really many; and they are preparing to write the chapter of a story never told before. 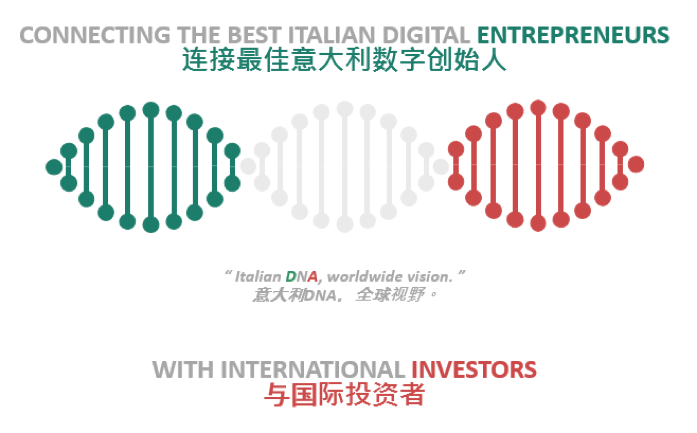 It is not usual, in fact, that Italian Accelerators come to China to present their startups. Below we give you a taste of all the protagonists of the Chinese stage of our World Tour. We will continue to know them better and better, up to the great act of Made in Italy 2.0.2.0 Beijing Edition; at the Italian Embassy in Beijing and the Residence of the Italian Ambassador. We can start from our official operational & media supporter: CAIXIN INSIGHT GROUP. Caixin Insight Group is the financial service branch of Caixin Media, China’s most influential financial media group. Caixin Insight Group is the builder of China’s financial infrastructure in New Economic Era and it offers professional and forward-looking Insights to Chinese institutional investors. Other official supporters of the event will be: CAMERA DI COMMERCIO ITALIANA IN CINA, AMBASCIATA D’ITALIA A PECHINO and the ITALIAN TRADE AGENCY. The President of Camera di Commercio Italiana in Cina, the Italian Ambassador in Beijing and the Director of the Italian Trade Agency, were invited to talk about their respective working experiences and their opinion on the expansion of Made in Italy globally. So, in this edition, during the Demo Session, we will also have the speech from these important professionals. Now, we can switch to our official international sponsor, THE BOSTON CONSULTING GROUP. THE BCG is a global management consulting firm and the world’s leading advisor on business strategy. They partner with clients from the private, public, and not-for-profit sectors in all regions to identify their highest-value opportunities, address their most critical challenges, and transform their enterprises. Their customized approach combines deep insight into the dynamics of companies and markets with close collaboration at all levels of the client organization. This ensures that their clients achieve sustainable competitive advantage, build more capable organizations, and secure lasting results. Founded in 1963, BCG is a private company with to 85 offices in 48 countries. But the final protagonists of all Made in Italy 2.0.2.0 are the startups, 8 are now the finalists of Beijing Edition, but two new entries are going to be formalized and we will let you know their names shortly. ARMADIO – an e-Commerce that brings Italian luxury fashion from Italian craftsmen directly to international market. BRAINER – the company’s vision is to provide Neuropsychologists, Geriatricians and Neurology, technologically innovative tools that can improve and simplify their work by increasing patient effectiveness. CREDIMI – a digital product, already adopted by the most dynamic companies, which allows customers to invoice and invoice within a few hours, directly from the finance and business cashier or any device. D-ORBIT – a first-mover in the market of decommissioning devices and a disruptor in next-generation commissioning solutions. ECHOLIGHT – providing the world medical community with the very first radiation free and office-based solution for the Early Diagnosis of Osteoporosis. FLUENTIFY – an effective, natural and measurable method to learn English by speaking it. WEARABLE ROBOTICS – focused on the design, development, production and commercialization of advanced wearable robotic devices, eventually integrated with virtual reality systems, eventually integrated with virtual reality. YEWNO – building knowledge discovery software and services, leveraging machine learning, computational linguistics, and a vast reservoir of information from the most respected content providers in the world. With the startups, there are also our Equity Partners, 100+ entrepreneurs who want to support the growth of Made in Italy internationally and will also reach us in Beijing. And more than 100 Chinese and international VCs, ready to invest in quality Italian products. As you can see, the protagonists of Made in Italy are many and varied. We look forward to a fantastic Chinese chapter. Continue with us the walking to Made in Italy 2.0.2.0 Beijing Edition #onthefootstepsofmarcopolo. And stay tuned! We will shortly reveal the names of the last two finalists.